Vidya Balan, the brand ambassador of Indian Film Festival of Melbourne looked ravishing wrapped elegantly in whole 6 yards, mesmerising her fans as well as the people at Melbourne. For 3 different events, Vidya chose sarees only, which not only glorified our Indian culture, it made Vidya distinct from Others. These days, when Bollywood actresses choose the comfort and glamour of dresses, gowns etc., Vidya Balan appears as a saviour of Indian culture. Not only this, Vidya wore a dark pink saree handwoven and designed by Pinnacle-By Shruti Sancheti, which brings a ray of hope to Indian weavers. All jewellery was handcrafted by Apala by Sumit Sawhney. 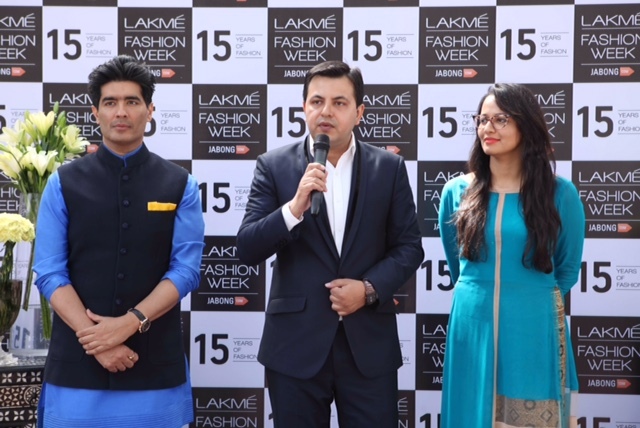 Fashion designer Manish Malhotra announced on 26th Feb.,2015 that he would take a leading role at Lakmé Fashion Week which launches WEvolve, a global campaign that empowers young men and women to challenge norms that lead to gender violence. This big show featuring The Blue Fashion Runway is a part of Lakmé Fashion Week’s 15 year celebrations. The global WEvolve campaign focuses on the worldwide problem of gender violence. The World Health Organization (WHO) estimates that 35 percent of women worldwide, over one billion women, have or will experience either intimate partner violence or non-partner sexual violence in their lifetime. Violence against men is both under-researched and under-reported. Q: What is elegance to you? MM: Elegance to me is when it does not scream, it is not crying for attention. It is a believe and courage and I feel that when you are beautiful and you feel beautiful, the true elegance is what you are, comes through.it doesn’t have to be something just screaming out, you know, so if you are wearing a beautiful neck-piece then let the necklace take over, wearing minimalistic earrings. If its a outfit which is very embroidered, over the top, cool it down with make up. Let one element takes center focus. And I think that being comfortable , not screaming and not seeking too much attention is elegance. Q. Whom do you think is elegant? MM: My mother is very elegant. I think, ummm, there are many women who are very elegant, it need not to be a celebrity, even from day to day walks of life, there are many elegant women. I think, the 50s & 60s era of Bollywood to me is the Indian fashion element which the most beautiful. Everything was very precise, everything was very neat. I really like that era. Like Sadhna , Madhubala, I am very influenced with that era. Q: And does that reflect in your creations? MM: I try to. I definitely do try to. 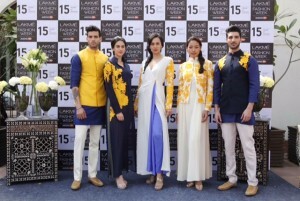 Q: Last year you predicted Gharara & Sharara is going to be big, and it came in vogue. What’s your prediction for this year? MM: Yellow is going to big this year; different blues are going to be big this year. I prefer blue to black. Gharara & Sharara will still have important place in outfits. I do lots of blue since last 2 year. Its goes well with my designing, it’s a colour which is going to stay. Blue yellow & ivory are going to be colour for this season. Q: Your name is synonym to a designing school. What is it that make you The Manish Malhotra? MM: My journey has been very different. I began with costumes, then I learnt a lot during my work, from costume to mainstream. Now I have larger than life stores, huge clientele, it means there is something I am doing right, besides all the hardwork. Q: You have worked with all leading actresses of Bollywood. Karishma & Urmila vouch for your designs.What is it that makes them so comfortable with you? MM: I don’t know that. What clicks with me is that I don’t take my friendship for granted. I have very old relationships, but I consistently work hard, I never take our friendship for granted. See till date for any appointment, I have never told anyone that ‘Sorry yaar, I am going to be late’. That I never do. I think the respect I give to time, to people, it’s something that they like. It’s their belief in me and my consisted working hard, and changing with time. I have changed with time, for better I think, don’t you also think so. Q: Given a chance to create a dress for Madhubala, Sadhna, Wahida Rehman, Vaijayanti Mala,whom will you choose? MM: I had a privilege of working with Wahida Rehman. Sadhna ji has certainly been very beautiful & elegant. Madhubala is not alive. I think in today’s time I would love to create dress for Wahida Rehman ji.